A very simple cream cleanser, with a light texture and intriguing aroma! surprisingly enjoyable to use! It is a very light cream, which needs to be applied with a cotton wool pad (organic if possible), and when I used this on my skin, I absorbed the product really quickly, which gave me the impression it is quite deep cleansing cleanser, even for a cream! The cotton wool pad also absorbed it rather well, so I used around 3-4 pumps from my little bottle. The balance range has a really subtle apple scent, which is quite different for skincare product, but it smells really purifying and uplifting! It makes a pleasant change to the usual lavender oriented more calming products. The cleanser needs to be removed using cool/warm water, this is great for the skin as using hot water can actually increase oil production and is harsh on the skin, so very fitting for the balance range. After rinsing the cleanser off my face with a muslin cloth, it felt very soft and looked fresh, but felt the tiniest bit dry, which was soon rectified by using the rest of the products in the range. Again, another very uplifting and energising product! The directions suggest spraying directly onto your face and letting it dry naturally, this is a really refreshing method of applying a toner, if you haven’t done it before definitely give it a try! I did give my face a little sweep over with an organic cotton wool pad afterwards just to get rid of the excess, and once dry my skin felt incredibly soft, and again looked very fresh leaving my complexion looking balanced. Results really are instant with this range! 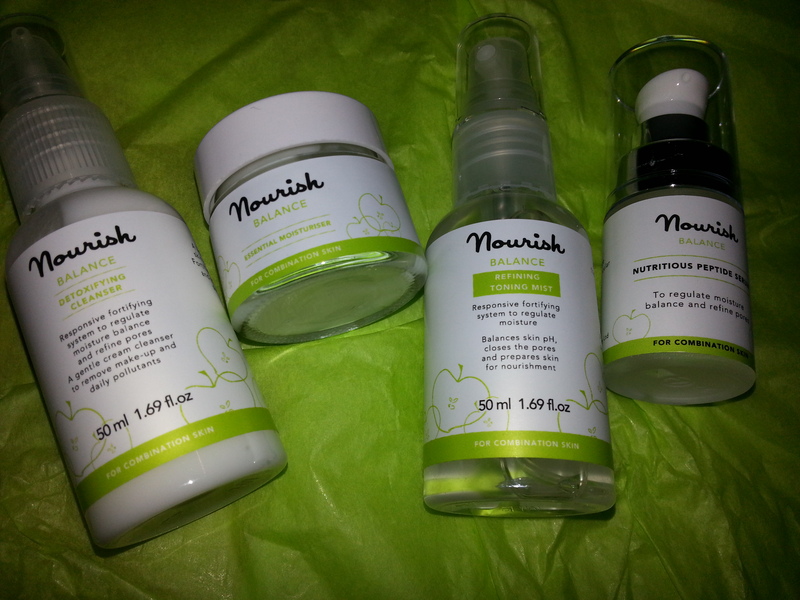 What I love about the Nourish range is how obviously natural the products are! I have absolute faith in using these products around my eyes, which gives me confidence in the safe ingredients. , thick… you name it – I’ve just never found one suitable for my skin! I tend to use oils where possible, as I do my skincare routine at night it doesn’t matter too much if I’m left with a bit of a residue in the morning as it just comes off in the shower. I was however very impressed with this product. At first when I was using it I did feel as though I wasn’t absorbing it well enough and it left me feeling a bit greasy before bed, but when I spoke to the Nourish team they suggested that I simply used less of it and low and behold, improvement was noticed! It made me worry a little bit that all my moisturiser concerns are simply because I have been using too much product, but this cream is noticeably different to most moisturisers aimed at my skin type (combination/oily/unbalanced). It has a very light texture, but isn’t a gel which is great as it still has a feel of luxury to it. I used about a pea sized amount for my whole face, which is quite impressive, and of course makes the products even better value for money which is fantastic. This product was a bit of a revelation for me, so I was very, very pleased and look forward to having perfectly moisturised and nourished skin for the foreseeable future! I love serums; there is always something that feels so luscious and luxurious about them. They are absorbed by the epidermis – this is great because it means they are genuinely moisturising, whereas some moisturisers can only create the illusion by sitting on top of the skin. I’m sad to say that surprisingly the Balance serum didn’t quite work for me. It left my skin feeling a little sticky, which isn’t out of the ordinary, this has happened even with toning waters – my face is very picky about what it likes! Although this serum wasn’t quite right for me, I have persisted and used it a few times since as I’m still sure that the ingredients are beneficial to my skin! 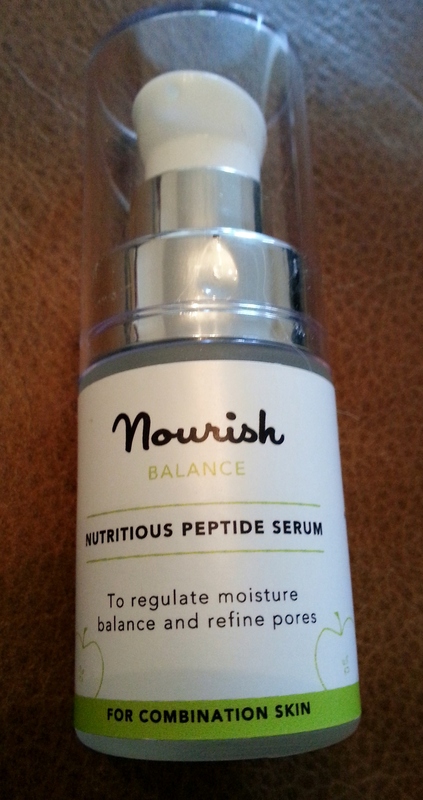 What I am pleased to say is that when I spoke to the Nourish team about my experience with the serum, they were incredibly speedy in rectifying the issue. Before I had even replied to the email I had another product on its way to me in the post! I have been absolutely blown away by the amazing customer service delivered by the team! I have been looked after incredibly well, and they seem to have a genuine interest in how I am getting on with the products. To me this shows great faith in their range, and a dedication to research and improvement. They also have an understanding that each customer is different and may need to mix and match the products. I know this seems obvious, but one thing I can’t stand is companies blaming the customers’ skin for any problems with their purchases, Nourish really are a cut above the rest! My Balance serum is being replaced with the Relax Hydrating Peptide Serum, and I look forward to updating you with the results! 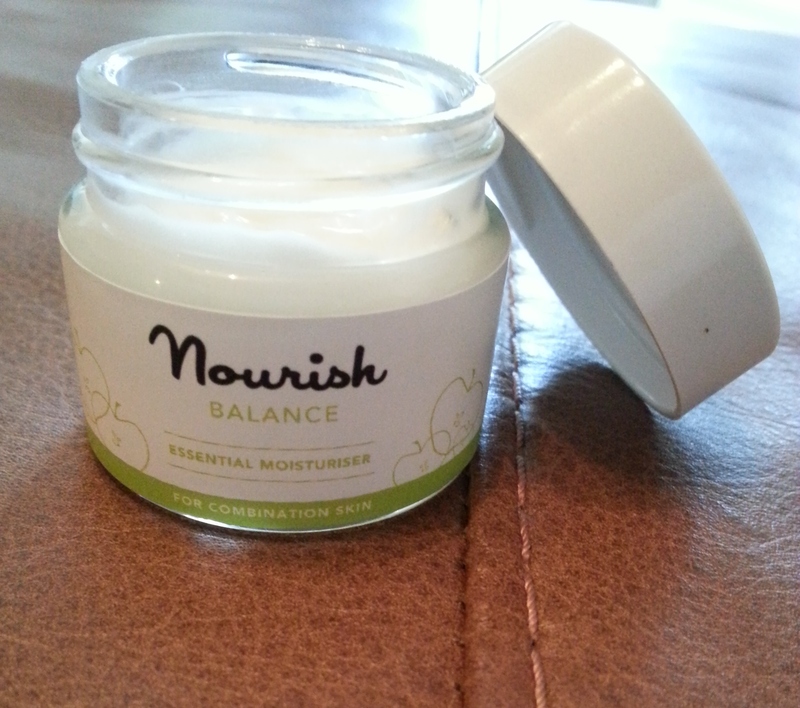 The Nourish Balance Mini Kit Retails for £24.99, which I think is great value. I think this would give around 2/3 months usage in the cleanser and toner, and a little longer for the serum and moisturiser. You can buy one here! Watch this space for my review on the Nourish Golden Glow Illuminating Face Shimmer and the Relax Hydrating Peptide Serum! Aqua (water), Pyrus malus (apple) fruit powder*, Pyrus malus (apple) fruit water, Helianthus annuus (sunflower) seed oil*, Crambe abyssinica seed oil, Glycerin, Glyceryl stearate, Sodium levulinate, Levulinic acid, Cetearyl glucoside, Cetearyl alcohol, Coco glucoside, Niacinamide, Calcium pantothenate, Sodium ascorbyl acetate, Tocopheryl acetate pyridoxine HCL, Maltodextrin, Sodium starch octenylsuccinate, Silica, Potassium sorbate, Xanthan gum. *Certifed organic. Aqua (water), Pyrus malus (apple) fruit powder*, Pyrus malus (apple) fruit water, Glycerin, Sodium Levulinate, Levulinic acid, Potassium sorbate, Coco glucoside, Niacinamide, Calcium pantothenate, Sodium ascorbyl acetate, Tocopheryl acetate pyridoxine HCL, Maltodextrin, Sodium starch octenylsuccinate, Silica. *Certified organic. Aqua (water), Pyrus malus (apple) fruit powder, Pyrus malus (apple) fruit water, Glycerin, Cetearyl alcohol, Prunus amygdalus dulcis (almond) oil*, Helianthus annuus (sunflower) seed oil*, Crambe abyssinica seed oil, Cetearyl glucoside,Sodium levulinate, Levulinic acid, Glyceryl stearate, Cetearyl olivate, Sorbitan olivate, Xanthan gum, Argania spinosa kernal extract, Serrenoa serrulate (saw palmetto) fruit extract, Sesmum indicum (sesame) seed extract. Beta sitosterol, Tocopherol, Parfum (apple aroma), Simmondsia chinensis (jojoba) seed oil, Niacinamide, Calcium pantothenate, Sodium ascorbyl acetate, Tocopheryl acetate pyridoxine HCL, Maltodextrin, Sodium starch octenylsuccinate, Silica, Potassium sorbate. *Certifed organic. Aqua (water), Pyrus malus (apple) fruit powder*, Pyrus malus (apple) fruit water, Glycerin, Palmitoyl tripeptide-5, Niacinamide, Calcium panthothenate, Sodium ascorbyl acetate, Tocopheryl acetate, Pyridoxine HCL, Maltodextrin, Sodium starch octenylsuccinate, Silica, Coco glucoside, Xanthan gum, Sodium levulinate, Levulinic acid, Potassium sorbate, Sodium hyaluronate, Parfum (apple aroma), Simmondsia chinensis (jojoba) seed oil. *Certifed organic. ← Arbonne Reviews Coming Soon!